Back around 2007 or so, topics pages were a slam dunk. They were a tried-and-true strategy for capturing category-level search traffic for our publishing clients. 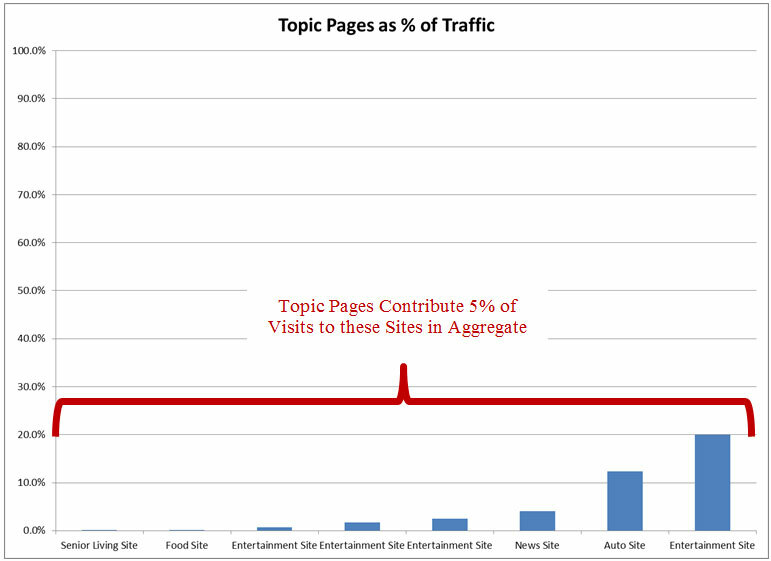 A properly executed topic page strategy was primed to capture traffic for high volume terms such as celebrity names (“Angelina Jolie”), general news topics (“Social Security”) or industry-specific category terms (“BMW”). We worked closely to launch and optimize topic pages for existing clients, and encouraged any new clients to invest their resources in topic pages as a major part of their SEO strategy. And our clients new and old consistently benefited from doing so. In this post, we’re going to share some aggregate and anonymized topic page data trends over the past five years, discuss best practices for building successful topics pages in today’s search environment and describe the specific challenges that topic pages face these days. This way, if you’re developing a topic page project, you’ll have your eyes wide open to the challenges you’ll face, and you’ll be able to level-set expectations to your colleagues and clients if you start down the topic page road. Wait, What’s a Topic Page? Now that definitions have been established, let’s turn to the methodology I used for this topic page analysis. Although we can’t reveal specifically which sites we included in this analysis, we can say that the eight sites we looked at each had significant amounts of traffic, averaging in aggregate over 200MM visits per month in 2011. We also chose sites that covered diverse fields, choosing publishers involved in the the entertainment, news, food, senior living and auto verticals. And finally we included these sites because out of our client roster, they have made significant investments in topic pages through the years. 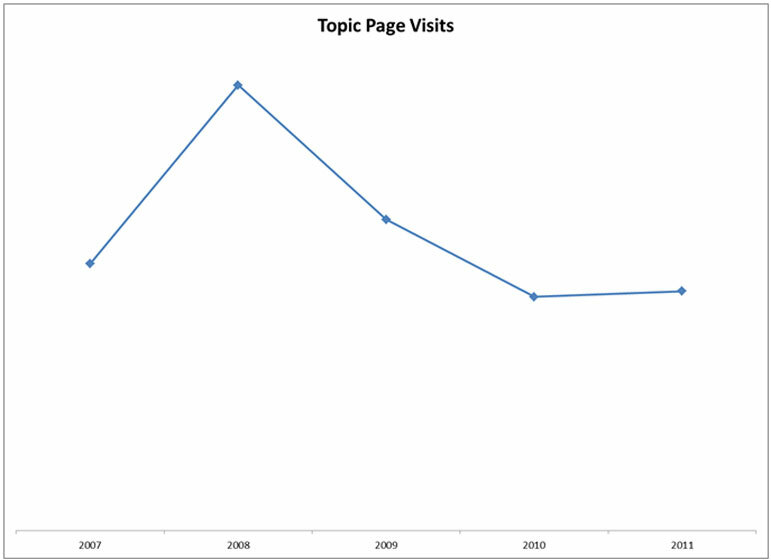 As this chart shows, immediately post-launch in 2007, this client’s Topic page traffic took off, and continued to perform well in 2008. In 2009, however, the trend reversed itself sharply, and in 2010 and 2011, topic pages have basically treaded water, at slightly less than 2007 levels. So, Why are Topic Pages Losing Traction? Although there are a number of reasons for the general topic page decline we’ve seen, the major driver of traffic away from topic pages has been Google’s evolution in the SERPs towards recency and diversity. Query Deserves Freshness (QDF), and the integration of news, image, video and now social results not only push down topic pages, but also push down topic pages exactly when search volume peaks for the subjects they cover. 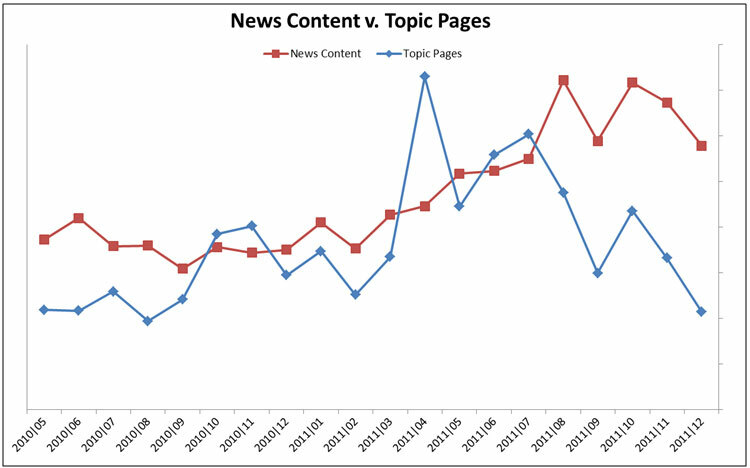 For this site, there’s been a general upward climb in news traffic, with some normal month-to-month variability, but topic pages in December 2012 are at or below their levels in May 2010 (the first month we had data for). By optimizing articles, videos and photos to take advantage of Google’s QDF and universal search results, this site’s investment in editorial SEO positions them well for future organic growth. Ok, So Should We Just Give Up on Topic Pages Altogether? No. Topic pages still have value. If done right, they’re valuable hub pages for users, and they can still drive some traffic from search. But you should understand their limitations when making the business case to allocate resources to their design and development. In today’s search environment, topic pages function best as a secondary SEO play. 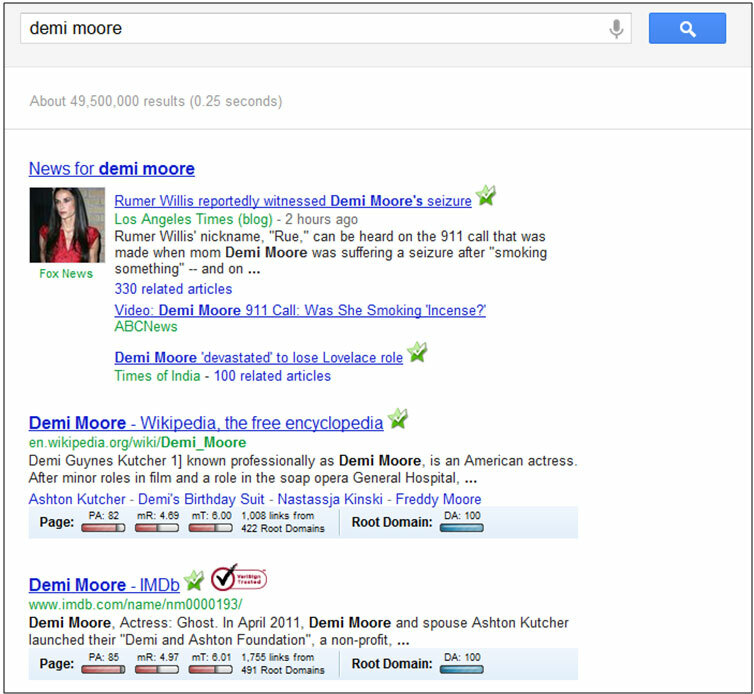 For example, as Demi Moore shuffles out of the news cycle, topic pages will rise up and gain traffic as search volume declines. If – and this is a big if – you are able to get in universal search’s news box with the article you wrote about Demi Moore, while also developing a strong topic page that consistently appears above the fold on page 1 of the SERP’s, you’ve hit the search sweet spot, optimizing articles for breaking news, and positioning your topic pages as an evergreen traffic source. It goes without saying that ranking for a celebrity like Demi Moore is extremely difficult, so in addition to topic pages driving secondary SEO traffic, we find that it can take 12-18 months before a new topic page initiative really starts gaining traction. Google hates hates hates thin content. Developing thousands and thousands of sparsely filled, auto-generated pages from your database is tantamount to daring Google to Pandalize your site. Instead, develop a handful of topic pages focused on some combination of your site’s expertise, the competition level for that term and how frequently you develop content for it. In other words, develop limited topic pages for your subject matter expertise. That will put you in the best position to succeed. If you throw up a haphazard-looking topic page that doesn’t provide real value to the user, you’re not going to generate the social shares and organic links so critical to any audience development initiative. Create topic pages that are valuable, that are distinct, that contain a flavor of your site’s voice, rather than robotic assimilations of archived content. If you make your topic pages feel like they’re alive and serve a real value to your readers, then they’ll have a much better chance of surviving Google’s algorithmic whims. 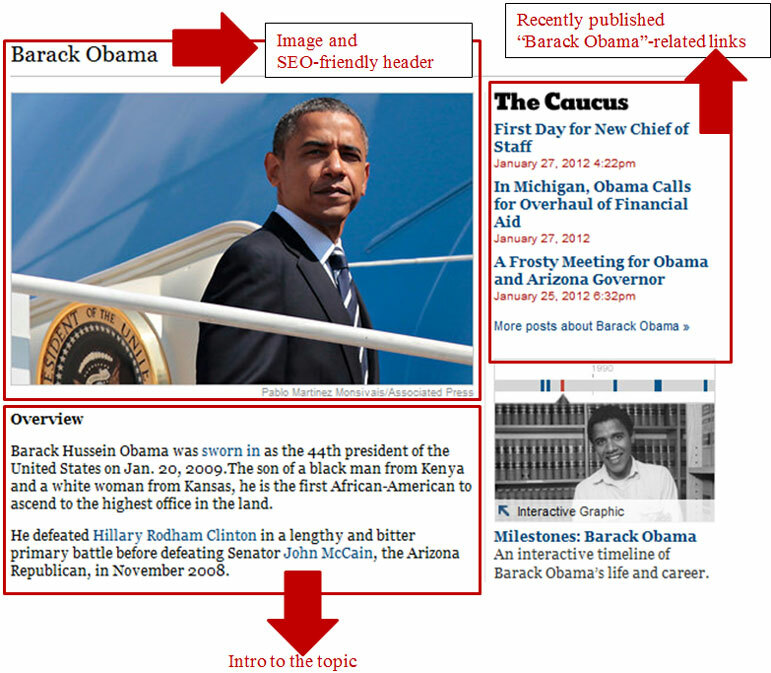 Topic pages will not be successful if they aren’t fully integrated within your site. Is it easy for editors to link to them? How are they otherwise promoted on the domain? Do your topic pages have strong social media touts? How frequently are they updated with the latest published content? The answers to these questions determine the long-term viability of your topic page project. I’ve come neither to praise topic pages, nor to bury them. Developing topic pages won’t lead to an immediate traffic lift, but if done correctly may pay off dividends in the long run. In today’s search environment, they’re best considered a secondary play, diminished from their powerful past but still viable enough in the present to send consistent, evergreen traffic.